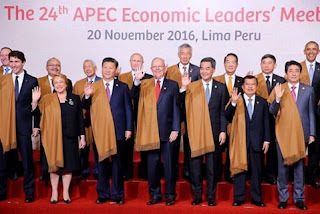 The 2016 APEC Economic Leaders’ Summit has concluded with APEC Leaders releasing the Lima Declaration that seeks to strengthen connectivity, food security and development around the Asia-Pacific. Meeting in Lima, Peru, under the theme of ‘Quality Growth and Human Development,’ APEC Leaders have committed to maintain focus on advancing free trade. As part of this commitment, Papua New Guinea’s Prime Minister, HPeter O’Neill said APEC will continue to take into account the circumstances of all economies in the region and recognise that not all elements of globalisation are beneficial for all people. “It is important that we maintain our focus on the arrangements for free trade that have so far served us well over many years,” the Prime Minister said to fellow Leaders at their meeting in Lima. “Papua New Guinea is fully supportive of the removing of explicit and hidden barriers to trade throughout the region, but it must be in a measured manner. “Sentiments being expressed by people all around the world today are that Globalisation is not necessarily beneficial for everyone. “As a result of that, many of the most vulnerable people have been affected by some of the arrangements and agreements that we have put in place over the years. “Yes, there has been growth, but there have also been people affected by the loss of jobs and income, and many small businesses and micro businesses have not been able to be competitive when larger multi-nationals come into their markets. “This is particularly the case in emerging economies as well as for some of the developed economies. “Despite some structural reforms that have been underway in our respective economies, and how we manage our state owned enterprises, these issues continue to linger. Prime Minister O’Neill also called on Leaders to enhance focus on APEC’s evolving role and objectives for the forum over the next decades. “One of the areas that I think we need to look at is APEC’s core focus beyond the Bogor Goals for free trade and investment after 2020. “APEC needs to look at our objectives, because the regional economy has changed dramatically since Leaders set the Bogor Goals in 1994. “That is why we must be proactive in charting a new course to better enhance trade and investment in our region. “It is important that, as a forum, we remain relevant to the dreams and aspirations of our people. The Prime Minister also highlighting the importance of increased regional connectivity and the relevance this has for creating an environment for small business. “On the issue of integrating the Asia-Pacific and enhancing connectivity, there is more that we can do. “Today, we live in a world where connectivity should be easy. “We have more submarine internet cables crisscrossing the globe, we have more flights and more shipping than at any other time in the history of the world. “But connectivity is undermined by bureaucracy and red tape. “APEC leaders must take charge so that we can break down these barriers to connectivity. “Our APEC Senior Officials have the right approach to enhance the Ease of Doing Business but they need our political support. “When it comes to Micro, Small and Medium Enterprises in the APEC region, we Leaders have to be proactive and create the right environment for them to have opportunity. “Our small businesses must also be able to better connect and to participate in global supply chains. “I am encouraged by the reports that we are getting from around the region of the contribution these small businesses are making to the economy. “It goes to show that we should not just depend on multinationals to build the economy. “We need to set tangible connectivity objectives that increase the quality of APEC transport networks, modernise customs and border agencies, and open better lines of communication. PM O’Neill concluded his remarks by highlighting the importance of continuing to deal with climate change and the affect it has on communities and the economy. “I appreciate the contributions and support of President Obama, President Xi Jinpeng, and other Leaders, particularly at COP-21 in Paris last year,” the Prime Minister said. “They took leadership of the concerns of many of the smaller island nations, the most vulnerable countries that are threatened by the affects of climate change. “These nations will no longer be countries if we do not focus on these challenges. “This is the reality of what we live in now. “If we do not stay focused, climate change will threaten the development and economic issues that we are talking about in in this forum. The Prime Minister said he hoped the following year will be another year of achievement for APEC.